View More In Computer Components - Page 2. The VP 450 is crafted for just three things: Quality, performance and incredible value. 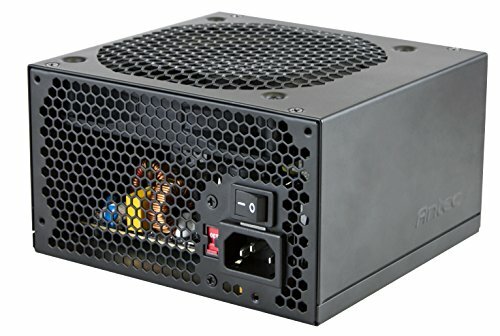 So this entry-level ATX12V 2.3 and EuP 2010-compliant solution gives you everything you need in a power supply, nothing you don’t. No twinkly lights, no glittery paint job – instead, you get a quiet 120 mm fan for effective, quiet cooling, dual +12V rails for amazingly stable power, and Over Current, Over Voltage and Short Circuit Protection on all rails for complete peace of mind, no matter how demanding your system. And since we provide every VP 450 with Antec’s AQ2 Antec Quality 2-year warranty on parts and labor, you also get all the assurance of knowing we stand behind your PSU’s quality. Antec’s acclaimed Basiq line of power supplies set the worldwide standard for quality, reliable power with unbeatable value, and the VP 450 continues the tradition. For builds that are strictly business, get strictly power with Antec’s VP 450. 80 Plus Certified. If you have any questions about this product by Antec, contact us by completing and submitting the form below. If you are looking for a specif part number, please include it with your message.